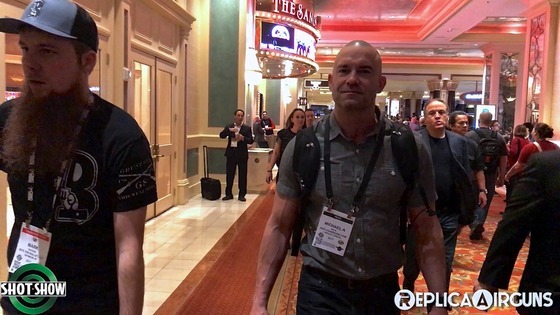 I figured the best way for everyone to get an idea of what it's like to be at SHOT Show was to walk around and record some video using my Samsung Gear 360 Video Camera for you. The first few minutes are just me walking around checking things out at this years SHOT Show 2018 in Las Vegas. After which I walk around of some of the more popular Airgun related booths: Crosman, Sig Sauer, ASG and Umarex. I wanted to start my SHOT Show 2018 Interviews with Crosman because in my books they had one of the most exciting new products this year at SHOT Show, the Crosman Remington DPMS SBR which is a duel 12 gram CO2 powered 4.5mm steel BB firing AR styled semi and full auto Machine gun. 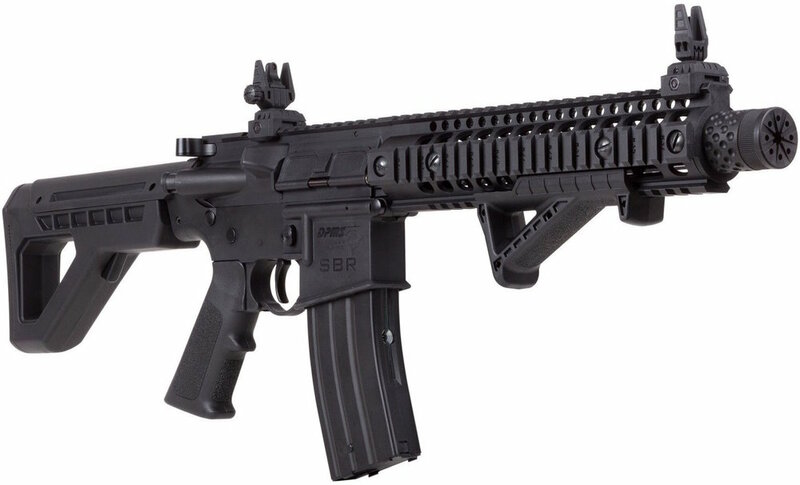 What I like about the Crosman Remington DPMS SBR is that it works a lot like an Airsoft Gas Blowback rifle with an internal bolt and buffer tube spring, working charging handle and dust cover, it even has a bolt release button. 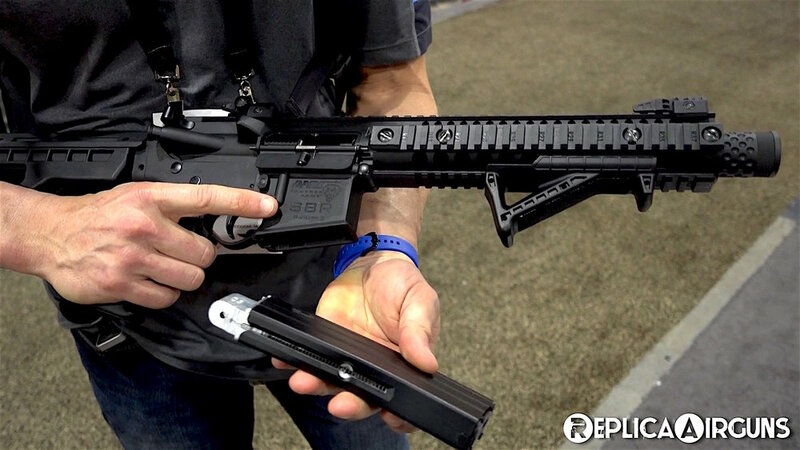 The Crosman Remington DPMS SBR can even be taken apart similarly to a real AR rifle. 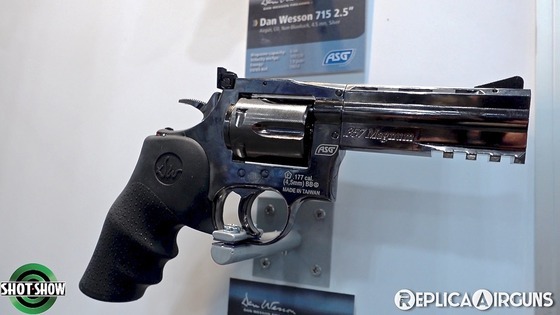 The next new interesting product from Crosman, and as I found out the design is not entirely exclusive to Crosman, was the CO2 Non-Blowback Pellet firing 1911. The Crosman Pellet 1911 has an interesting magazine design, it looks like a traditional full size drop out magazine, which as you would expect holds the CO2 but rather than an inline BB magazine the new Crosman Pellet firing 1911 has two built in 6 shot rotary magazines that can be flipped so you essentially end up with a 12 shot magazine. 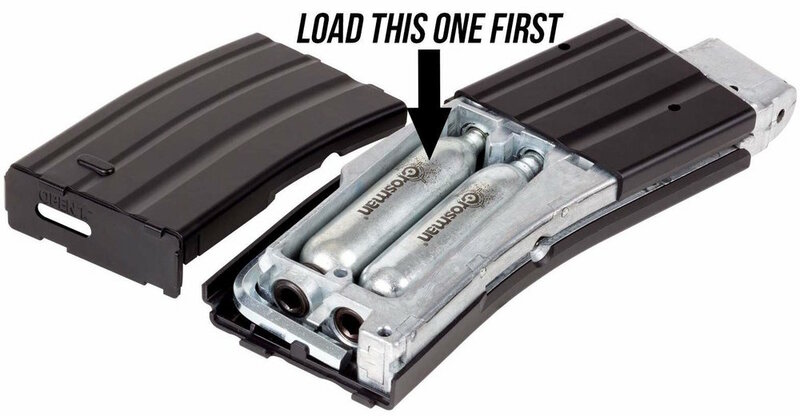 You will have to drop the full size magazine after the first 6 shots to flip the rotary magazines. The Crosman Pellet 1911 does not have blowback action but the double action only trigger is smooth and not too heavy. The slide is metal with a metal magazine and a polymer frame. The Crosman Pellet shooting 1911 comes in silver and black. 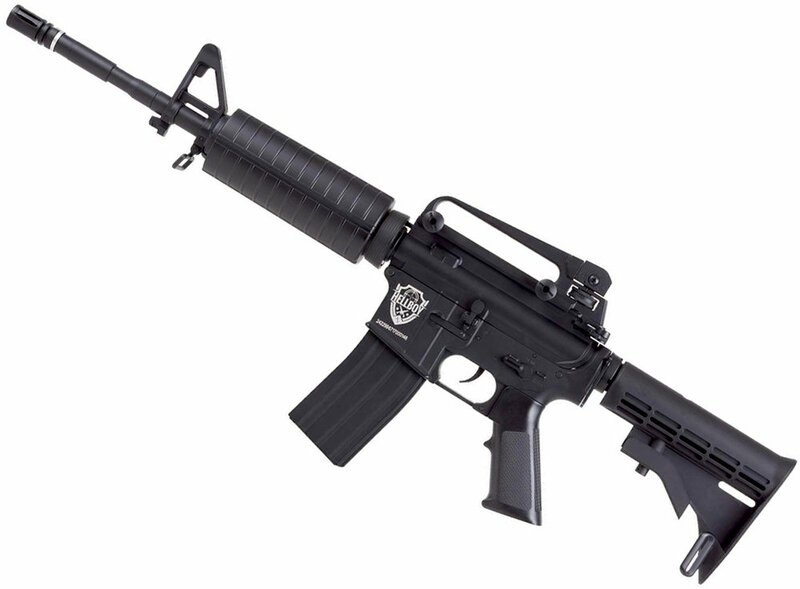 The next new product from Crosman was the Mako. 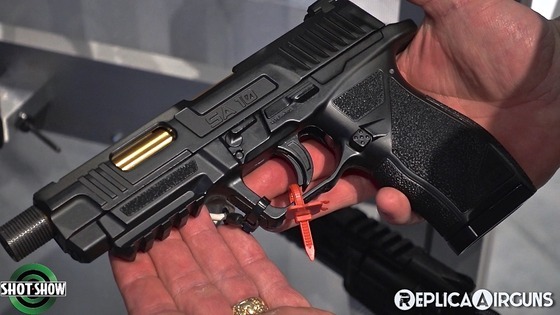 The Crosman Mako is a Beretta styled CO2 Blowback BB pistol. The Crosman Mako features Blowback action, fiber optic sights, tactical grips, a double action trigger and a stick magazine that holds the 4.5mm steel BB's. Thanks to Phillip Guadalupe from Crosman for allowing me the Interview! 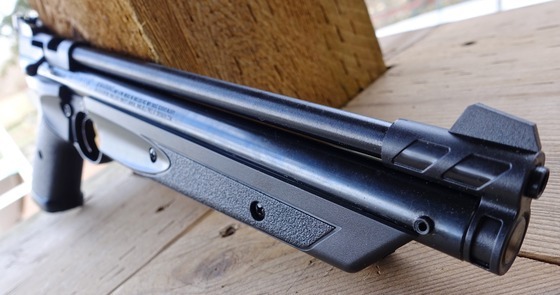 Another revisit for an inexpensive and fun BB shooter, the Crosman Marlin Cowboy BB Rifle! I have done some previous video reviews and comparisons for the Crosman Marlin Cowboy BB Rifle so make sure to check them out. 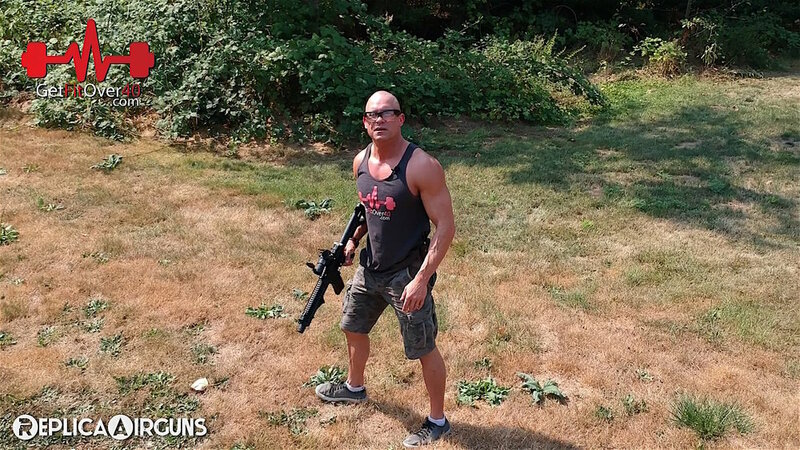 I also recently did an update Field Test Shooting Video for the Daisy Red Ryder BB gun which is a very comparable airgun to the Crosman Marlin Cowboy BB Rifle. Here is a quick overview of the Crosman Marlin Cowboy BB Rifle, it's designed for younger smaller shooter with it's short stock but it's still fun of all ages! You can store 700 4.5mm Steel BB's in its internal magazine and Crosman claims a max velocity of 350 fps. Like the Daisy Red Ryder the power source is a spring piston that is activated by the lever action. Now let's talk about how the Crosman Marlin Cowboy BB Rifle performed in my Sea Can Field Test Shooting test... Crosman claims a max fps of 350, my Chronograph results came in at a 5 shot average of 316 fps which is not bad compared to the Daisy Red Ryder that also has a claimed fps of 350 but only shot around 240 fps. So the Crosman Marlin Cowboy BB Rifle is the clear winner in terms of velocity over the Daisy Red Ryder but what about accuracy? 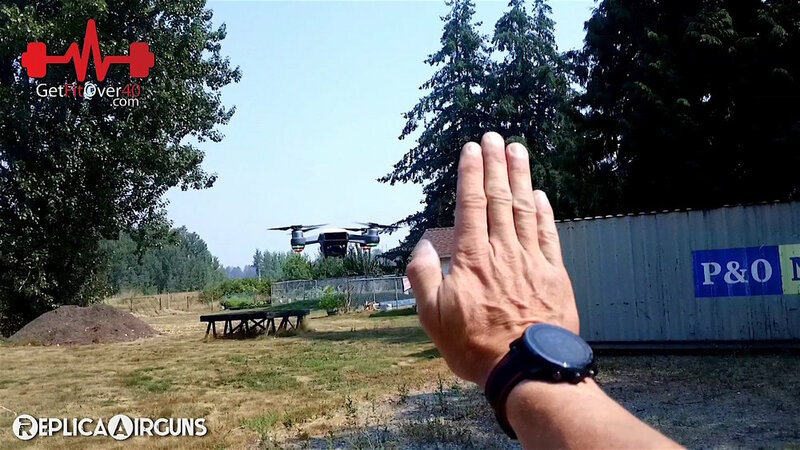 That's a different story, the Crosman did not perform all that great for me shooting at a paper target 30 feet away using a rested shooting position. I shot 10 rounds at my paper target and got about a 5-6 inch grouping, there was an underlying smaller tight group that was closer to about 3 inches but a god 3-4 of the BB's came out of it spreading out the group significantly. Compare that to the Daisy Red Ryder with a nice tight 2 inch group. 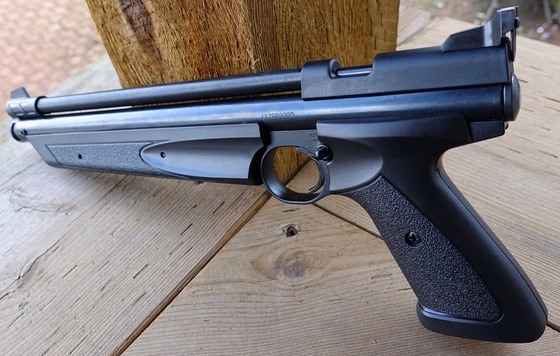 Since the Crosman American Classic P1322 22 Caliber Pellet Pistol is a multi-pump airgun there is no real need to shoot more than 3 or so shots, after all there is a fair amount of pumping involved. After three consistent test shots the variation was only about 2 fps apart coming in at an average of 491 fps using Crosman flathead pellets that I would say are around 12-13 grain in weight. Just for fun a did a half pump only cracking the Crosman American Classic P1322 22 Caliber Pellet Pistol 5 times to see what a half power shot would result in and it did scrub off about 200 fps, still good enough for target plinking. Next up I performed my accuracy test shooting from close to 30 feet back on a paper target using a rested position, (sitting in the back with my hands resting on a sand bag). Still a bit of human factor involved but stable enough to get a good idea of the accuracy for the Crosman American Classic P1322 22 Caliber Pellet Pistol. I had a bit of a camera technical problem so I ended up performing this test twice, the first time I got about a 3/4 inch 5 shot group. The second time I rushed it a bit and ended up widening out the group a little. 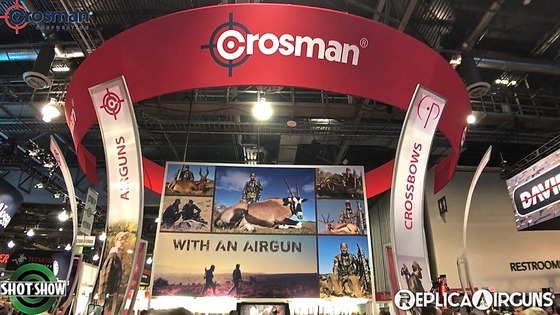 Enjoy my latest SHOT Show Interview with Jesse Caster from Crosman. 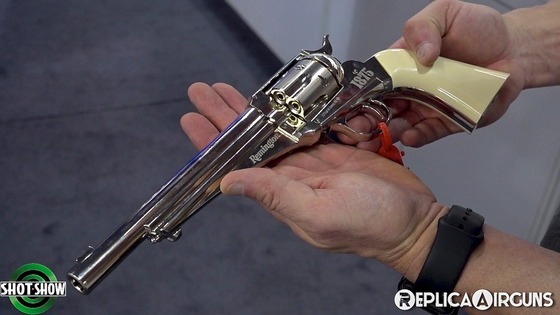 Jesse shows me Crosman’s latest old west single action revolver, the Remington 1875 which shares a lot with the super popular Colt Single Action Army revolvers. Jesse also goes over some new airgun pistols with me, a CO2 powered non blowback 1 to 1 replica of the Remington RP45, a very interesting single shot spring piston “Glock-ish looking pistol called the PSM45. 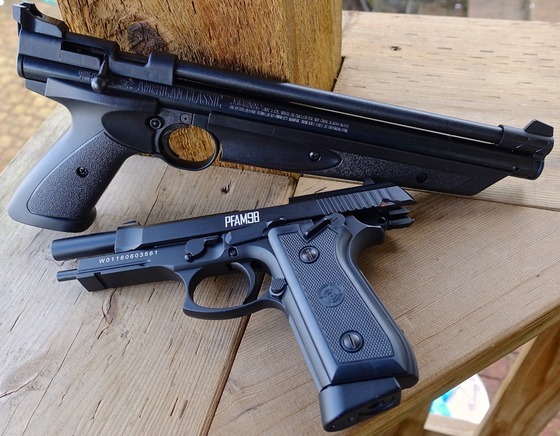 And last but not least, Crosman has now got on the Beretta / Taurus bandwagon and added the PFAM98 to their lineup. Crosman’s new Remington 1875 should be a welcome addition for anyone looking to add something new to their Old West Airgun lineup. The Crosman Remington 1875 like the Colt Single Action Army Revolver is shell loading, shoots in single action only and has that super slick ratcheting cylinder we all love. The Crosman Remington 1875 shoots both .177 caliber pellets and 4.5 mm steel BB’s from its smooth bore barrel, but Jesse has gone on record to claim that the pellets work well and shoots pellets and BB’s accurately at ranges typical for this type of Airgun. 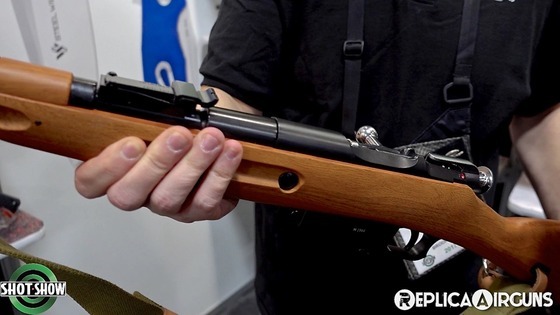 Another Remington Licensed Airgun from Crosman this year is the Remington PR45. The PR45 is a 1 to 1 replica of the real steal Remington RP45 but in a CO2 non-blowback 4.5mm BB shooting version. 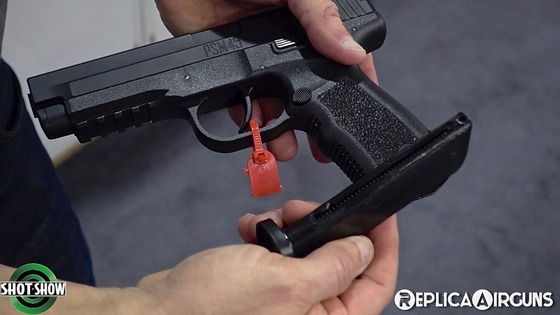 The Crosman PR45 has a metal slide and polymer frame with a drop out all metal stick magazine. Some other notable features for the Crosman PR45 are a working trigger safety and white dot sights front and back. If you are looking for something a little different from Crosman this year then checkout the single shot spring piston PSM45. 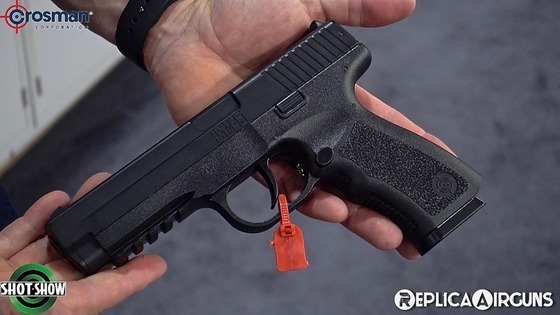 This super affordable air pistol kind of looks "similar" to a Glock and lord knows how many times I get asked what is available in an airgun that resembles a Glock. 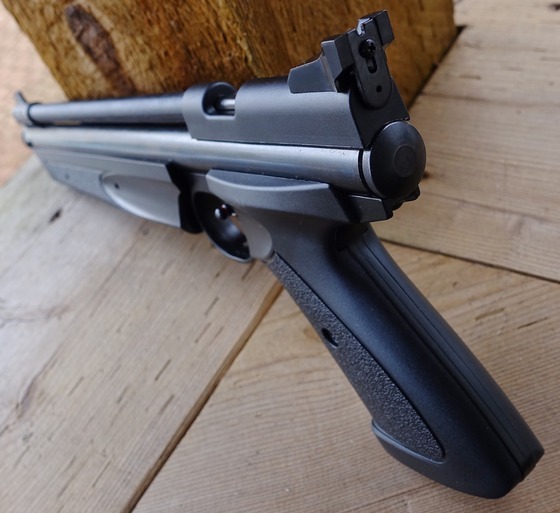 The Crosman PSM45 is not going to win any fps awards (shoots around 200 fps), but there is no need to buy any CO2 and you can shoot this airgun in virtually any temperature for only the cost of steel BB’s. The frame and slide on the Crosman PSM45 are plastic but it does have decent weight do some internal metal parts and an unexpected full metal full size drop out magazine. 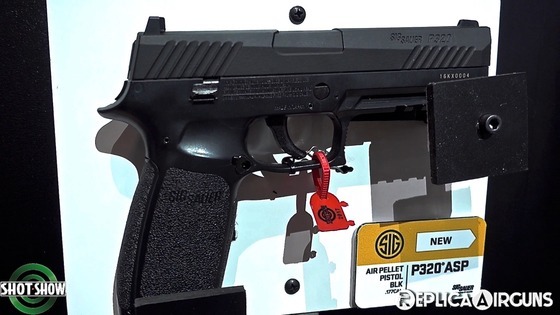 Crosman this year is adding a Beretta/Taurus full metal and full blowback CO2 BB Pistol to their product lineup. 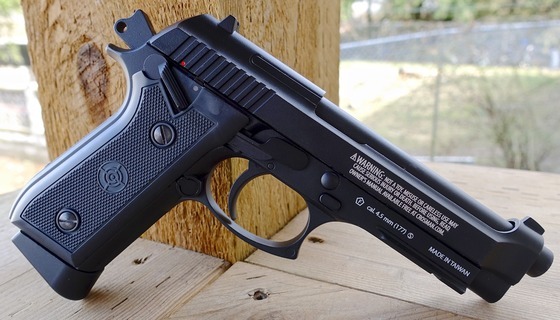 You may have already guessed it, it’s essentially a KWC Beretta / Taurus which really isn’t a bad thing since the KWC Blowback Beretta / Taurus has been very popular with replica airguners. 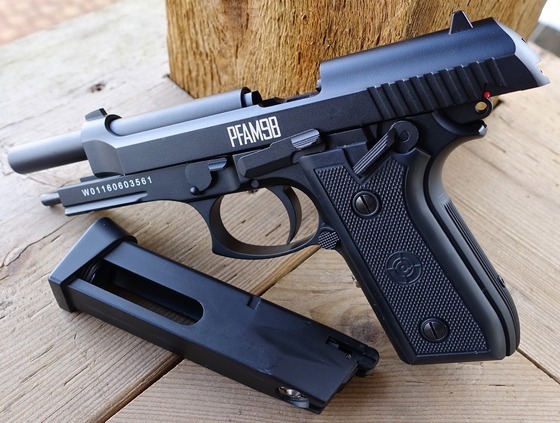 A nice little treat with the Crosman PFAM98 Beretta / Taurus is that right out of the box it shoots in both semi and full auto using the ambidextrous selector safety switch.